In his painting “Moonlight Night” S. Yu. 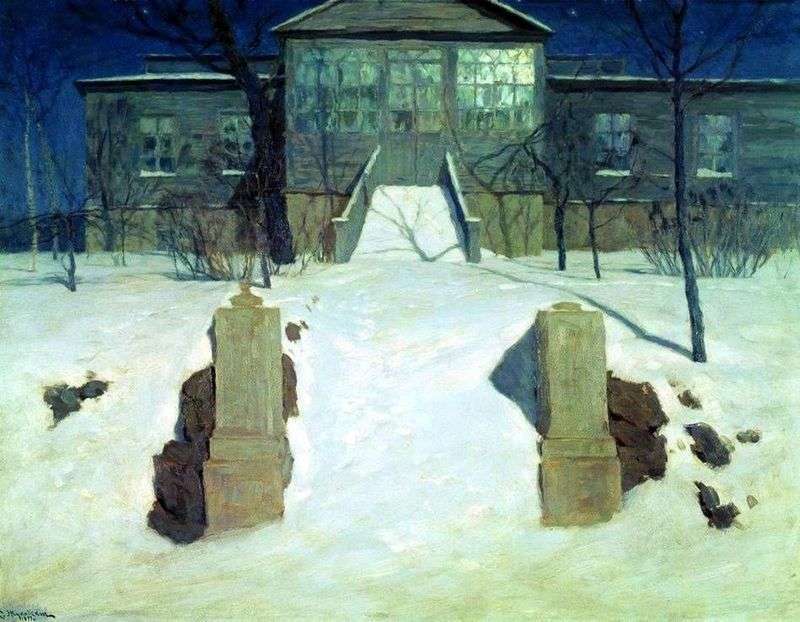 Zhukovsky depicts a winter landscape. In the center of the picture rises a rich landlord’s house. He seems gray and unfriendly. Its windows gleam the bright light of the moon. Everywhere there are snowdrifts knee-deep. Snow, lying on the roof of the house, is successfully combined with the wooden construction of the entire building. Because of this amount of snow, one does not even see the steps that lead to the house, not to mention those that are located just in front of the massive doors on the porch. Even on the eaves below the windows, white stripes lie recently fallen snow. The light of the moon is especially bright in the frosty nights. Now it’s such a night. Therefore, the moon freely illuminates everything around, and thanks to it you can clearly see every detail around the house. Here and there, in the snow, there are indistinct tracks left on the eve of the inhabitants of this house, which are now covered with snow. On the wall of the house ominously reflect shadows, falling from bare trees and bushes. Near the steps that lead to the house, here and there black stones are seen from the side, similar to small rocks. They are very well contrasted with the white background of snow. Through the thin twigs of trees can clearly see the dark blue starry sky. The stars, like, small lanterns that help the moon illuminate everything around. In general, the author’s picture turned out to be a little sinister and frightening. The smears on the canvas are very precise and clearly traced every detail in the picture. In the work there are no unspoken or undisclosed nuances, everything is very transparent and understandable. Description and meaning of the painting Moonlit Night by Stanislav Zhukovsky.